A few years ago (2004), C.K. Prahalad wrote the influential book Fortune at the Bottom of the Pyramid: Eradicating Poverty Through Profits . The book recognized that the world’s billions of poor people have needs and buying power. This segment of the world population is an immense and untapped opportunitiy for companies, but companies have to be able to learn new ways on how to serve them. It is not just simply to provide them with low cost products and services already in the marketplace, but it means innovations and new ways to reach consumers and help them to satisfy their needs. Nokia announced in November 2008 Nokia Life Tools, a range of innovative Agriculture information and Education services targeted to non-urban consumers. Designed specifically for emerging markets, Nokia Life Tools helps overcome information constraints and provides services to this next generation of mobile users. The 29 of June 2009 Google has announced in the Google Mobile blog “Designing SMS apps for mobile Africa“, with Google SMS and Google Trader.Google SMS is a suite of mobile applications which provides access, via SMS, to information on a diverse number of topics including health and agriculture tips, news, local weather, sports, and more. Google Trader is a marketplace application that helps buyers and sellers find each other. Users can find, “sell” or “buy” any type of product or service, from used cars and mobile phones to crops, livestock and jobs. Emerging markets are an untapped opportunitity with millions of people with needs and wants. People there do not usually have Internet access, but often have mobile phones. Here the opportunitiy with services based on mobile phones and SMS. The importance of “soft issues” in organizations is often underestimated. In my research on software evolution I have found that the main problems were not technical but involved communication problems and misunderstandings due to developing large software systems across the world where cultural differences, synchronization across time zones and organizational boundaries matter. I have documented these findings first in my journal paper Continuous Evolution Through Software Architecture Evaluation: a Case Study. Then I went deeper in the social structure by studying collaboration in software development teams using social network analysis. This is documented in my other journal paper Comprehend and analyze knowledge networks to improve software evolution. Communication means also having the ability to listen. Active listening is one of the techniques used to communicate in an effective way. How to listen, communicate and solve problems together are nicely described in a very good book by Thomas Gordon Parent Effectiveness Training . It is very interesting to note that the same understanding is needed in many contexts. Joseph Nye has written two very good books on leadership and soft power, The Powers to Lead: Soft, Hard, and Smart and Soft Power: The Means to Success in World Politics , see the post Joseph Nye’s “Leadership: A Dozen Quick Take-Aways”. To communicate in an effective way see my previous post marketing and persuasion, with links to Frank I. Lunt’s book Words that work: It’s Not What You Say, It’s What People Hear , and George Lakoff’s work, especially his book Don’t Think of an Elephant: Know Your Values and Frame the Debate. Negotiation is described nicely by Max H. Bazerman and Margaret Ann Neale in Negotiating Rationally . Another interesting book is Robert Cialdini’s The Psychology of Persuasion. Hofstede has written one of the most influential books on cultural differences Cultures and Organizations: Software for the Mind , and Edgar Schein Organizational Culture and Leadership (JB US nonFranchise Leadership) complements it. From Schein also Helping: How to Offer, Give, and Receive Help . See also my posts The importance of cultural differences and Culture, Organizational culture. The ability to communicate, listen, understand cultural differences and work in a cooperative way are fundamental. These soft issues should have a higher priority in our own personal development and in organizations. Apple has just launched the new version of the iPhone, the iPhone 3Gs. No major features were announced, and some of the features might make you smile such as “Cut, Copy & Paste”, ability to take a video, a 3-Megapixel camera and MMS. These features have been in the market for years and now Apple mentions them in the features list. But this fact shoud make us think why Apple has been so successful. In my opinion, the iPhone has been a disruptive innovation, even though the creator of the term, Claython Christensen, says that “it’s not [truly]disruptive”. The disruption in Apple comes from the understanding that people value features in a different way everybody assumed in the industry. The user experience is king. In the iPhone, the user interface makes the product easy to use, the integration with iTune and the App stores allows people to enrich the set of applications provided in the phone. In addition, the way they handled the creation of the platform is a lessons for everybody. The more users, the more developers willing to create the applications and the positive feedback makes the App store successful. There are several factors in this success, innovation is certainly one of the most important. 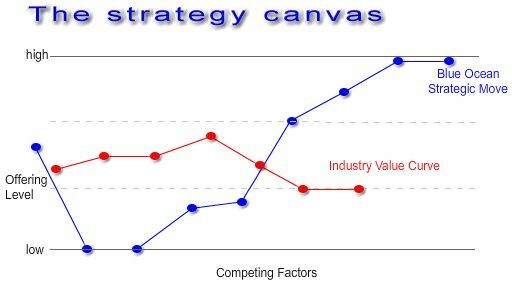 The strategic canvas from the Blue Ocean Strategy can help in the iPhone case. Firstly, it captures the current state of play in the known market space. This allows you to understand where the competition is currently investing and the factors that the industry competes on. Secondly, it propels you to action by reorienting your focus from competitors to alternatives and from customers to noncustomers of the industry. Microsoft´s answer to Nintendo Wii, pretty cool. Back in August I sent some feedback to the Google Book Search team about some nice features I wanted to have. And I was not the only one asking for similar features, see Matt Cutts post “Search your bookshelf with a $65 barcode scanner“. and on books owned by other people with a similar reading list to mine (like Amazon). Furthermore, I wanted to have the possibility to join communities that share the same books, and eventually interests (based on their library). Now you can import in Google your books using a barcode reader. The other features I suggested are still missing, but I am sure they will soon appear given that Google recently announced that by the end of the year it would allow publishers to sell eBooks directly through Google. See Google Selling eBooks: A Bold Step But Not The Last For The Search Giant, from Forrester, and Move Over, Amazon? Google Aims to Sell e-Books, from BusinessWeek. I hope it will not be using DRM, Google Video with DRM was discontinued, DRM severely limits the use of content and it is not user friendly, see my post Digital music business & DRM. An open platform is what we need, Amazon Kindle is a closed platform. For these reasons, I believe Google could be successful if it will use open standards and have ebooks be used on any reader (as also Forrester suggests). We have just launched today what we call, Mobile Indoor Positioning trial, at the Kamppi Shopping Center in Helsinki. The application is available for download at the Nokia Beta Labs and at the actual mobile website http://kamppi.nokia.mobi. The indoor positioning functionality uses the WLAN access points of the building and it is only available on Nokia S60 devices equipped with Wireless LAN at the moment. The actual trial takes place in the Kamppi shopping center, and the positioning works only there. But anyone in the world can access the mobile site at kamppi.nokia.mobi.